As UK residents continue to abandon payments of the TV License Fee and instead rely on free and subscription models for news, films, and entertainment - BritBox UK has been announced. The proposed "new transformational streaming service" isn't the first time such a project has been in the works, the BBC, ITV and Channel 4 proposed a Netflix-like service for content codenamed 'Project Kangaroo' back in 2007. Furthermore, the BBC and ITV already run a BritBox service in North America, so much of the model/offering is likely to be similar. A report published by BBC News gives us some more important information, like the launch date and expected pricing. 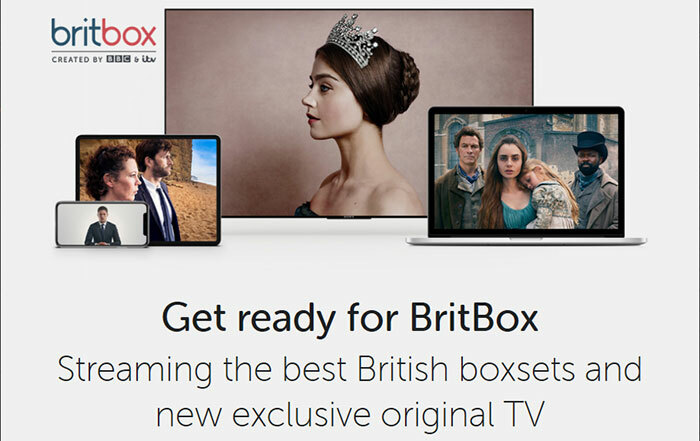 UK dwellers should be able to subscribe to BritBox from H2 2019 and should expect to pay about £5pcm for the service. After studying recent research on audiences, the BritBox collaborators reckon residents at 43 per cent of UK homes are interested in a BritBox subscription. That could add up to quite a nice revenue stream for the BBC and ITV. Investments will of course be required by the companies, to setup and maintain BritBox UK. ITV will spend £25m on the venture this year and £40m in 2020 according to BBC News, but the BBC's investment wasn't disclosed. The existing BritBox service in North America, live since early 2017, costs subscribers US$6.99pcm and has spawned some BBC & ITV co-productions such as The Bletchley Circle: San Francisco. It has garnered more subscribers than were expected (half a million so far) by the likes of the BBC's Lord Hall. The new BritBox service isn't intended to replace BBC iPlayer or the ITV Hub. The paid-for streaming service will be a "permanent, comprehensive home where anyone in Britain can get all of our library content - both the ITV and BBC library - in one place and they can watch it anytime, anywhere," according to ITV's Dame Carolyn McCall. That offers a functional extension to the service iPlayer and ITV Hub offer (live streaming and short-term catchup of programmes). If you are keen to know more about BritBox, you can sign up for news and updates via the UK service's home page. If it gets new content quick enough, I can see myself ditching the TV License and using this instead. So pay for a license to fund series they can sell to America, allowing them to increase their bonuses and give them seleves a pat on the back. Altered Carbon, Breaking Bad..etc,etc Then I might consider it. But not while its stuffed full of parochial British period costume drama crap.